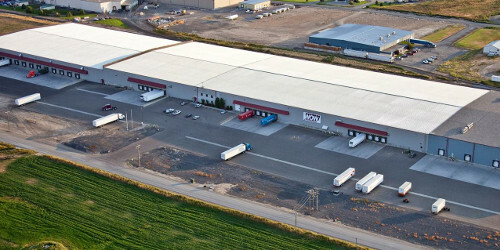 DESCRIPTION: The WOW-Jerome, Idaho warehouse, located just 100 miles southeast of Boise, Idaho is an ASI Superior Rated food grade distribution center that began operations with 232,650 square feet and has grown with an expansion to 307,650 square feet. The WOW-Jerome DC is a multi-temperature facility with ambient (dry) and refrigerated (cooler) warehousing storage areas, as well as a USDA approved cheese grading room. The refrigerated area is designed for variable temperatures ranging from 40 degrees to 53 degrees. This Jerome, ID public warehouse offers easy access to Interstate 84 and is rail served by the UP (Union Pacific) Railroad. The WOW-Jerome Distribution Center is a featured Cheese Financing Program facility. The electrical design included a 3000 amp utility service entrance, normal power distribution, lighting, and lighting control.